Image: Winner Nick Stevenson with members of the jury. Subtropical gardens, innovative co-working spaces, public plazas and commercial and residential towers are just some of the ideas behind the winning entry of the 2016 Urban Land Institute Urban Innovation Competition. The City Stitch was announced as the 2016 winning entry by Planning and Development Chair, Councillor Julian Simmonds in Brisbane. The City Stitch focuses on reconnecting people from all walks of life with nature in an urban ecosystem of living, working, collaborating and connecting, and attempts to redefine urban communities in they way they, and their occupants interact with them. In the winning entry, the zone formerly dominated by Centennial Place is transformed into an Urban Jungle where subtropical boulevards provide a sense of scale and identity to the site with a unique and rich mix of vibrant living, of commercial and creative economy, of cultural and community diversity and recreational opportunities adding life and energy to the precinct. Urban Land Institute Australia Executive Director and jury Chair David McCracken said The City Stitch celebrates Brisbane’s subtropical climate and world class amenities. The City Stitch creates a critical mass of development in its own right, needed to balance its high infrastructure cost, that creates connection by infilling the focus area as an identifiable gateway rather than dealing with it as a transitional zone. The Jury acknowledged the entry recognises that the fundamentals of successful urbanism are delivered by bustling streets, living towers, elevated gardens, lifestyle offerings and compelling connections supporting our higher density urban fabric. The Jury noted that over generations the City Stitch could well be renowned for its city significance, and really redefine Brisbane’s skyline and image to the world. “The aim of the competition was to encourage the creative talent and innovation of Brisbane’s youth and engage them in developing the future of our city,” Mr McCracken said. “We would like to thank everyone who entered the competition and the support we received for the competition – from the Lord Mayor and the Councillors, right across the property sector. The City Stitch will now present their idea at ULI’s 2017 Asia Pacific Summit in Singapore, further showcasing Brisbane on the international stage. 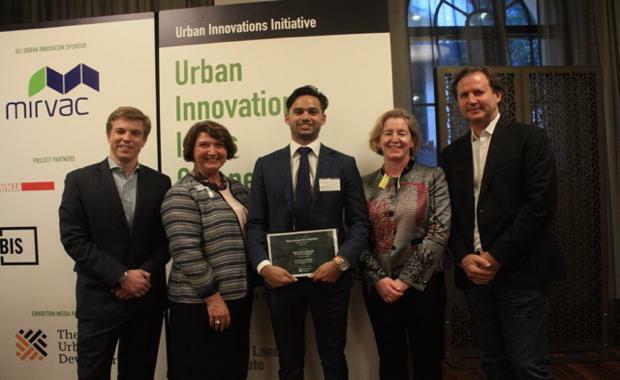 The Urban Innovation Initiative is an annual competition undertaken by the Urban Land Institute to promote fresh international ideas on urban issues with support from the Urban Innovation Initiative headline sponsor, Mirvac. This year’s competition is supported by local project partners Rothelowman, Urbis, CBRE and Brisbane City Council.